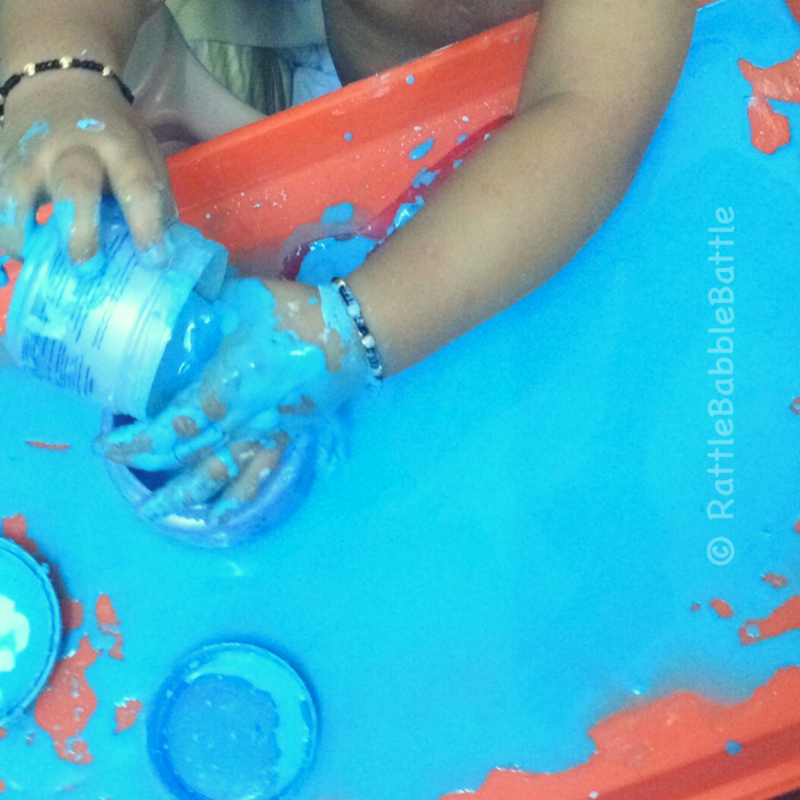 This time for our weekend activity we chose a messy play as summer leaves us with no option but to stay indoors and what better than a messy indoor play. A sensorial activity with toddler means lot of exploration and hence the stuff might just end up in their mouth.I am still not comfortable with the slime available in the market and decided to make a non toxic edible slime, so that even if the slime ends up in the mouth I won’t go berserk. Mix cornstarch with water till you get the gooey consistency.Adding food colour is optional but to make it more attractive it is advisable. Cornstarch has the property to bind when mixed with water into solid but the moment it is dropped down it drips as liquid and again solidifies. It can be a fun solid-liquid science experiment for older kids. Nirvaan initially was not able to pick it up and play as it was solidifying hence added little more water to make it more gooey for him to play easily. He used everything to lift it tong, spoon,fork. Applied on his body as cream. Had fun pouring solid as liquid. Mixed it and messed around for almost an hour or may be more. He was not ready to leave it and I had to finally lift him so that he could take a shower and I am pretty sure he would have enjoyed for another hour if left. 1.I have used the high chair for him to play as that would limit his area. 2.Used a separate tray instead of using the high chair tray. 3.The activity was timed right before the shower time. 4.The high chair was placed right outside the bathroom.its really hot here so balcony or open space was not an option for us. 5.No clothes were on not even an apron to save me from the washing and removing food colour stains from clothes if any. Hope this activity and my tips for a less messier activity would help you try this out.And if it does don’t forget to share it with us. I will try this with Zuzu for sure! So innovative. He might have enjoyed a lot. Innovative idea. This will help us to keep kids busy. Will surely try. Oho! I want to play too…My kids love making and playing with slime. Pictures say a 1000 words. So much fun in messy play. Awww look at that little one enjoying it so much. he had great time !!!! seems enjoyed a lot the activity. thanks for sharing lovely ideas. He seems to be enjoying so much. I think even as adult such activity must be so relaxing for us! Slime is something which I myself like to play with, leave the kiddos 😉 …Its a fun activity and for your baby it seems to be the most enjoyable thing. Kids love slime here too but I have had no success with this recipe. I have always bought from stores. Really creative and free play for kids. Cute clicks. You tips at the end impressed me much. I am going to try this soon. It looks very interesting! 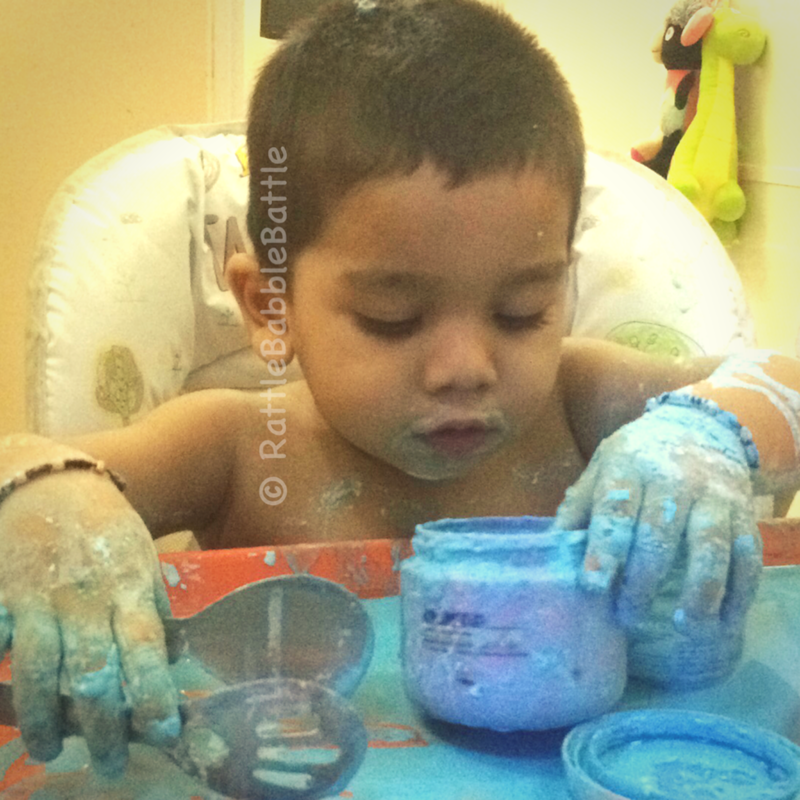 My son love sensory play. Shall try this soon for him.